I must apologize for such a long silence… due to unforeseen circumstances: a short weekend trip to Tuscany turned into a three-weeks absence from Paris due to a health problem. I am so happy to be back to Paris! 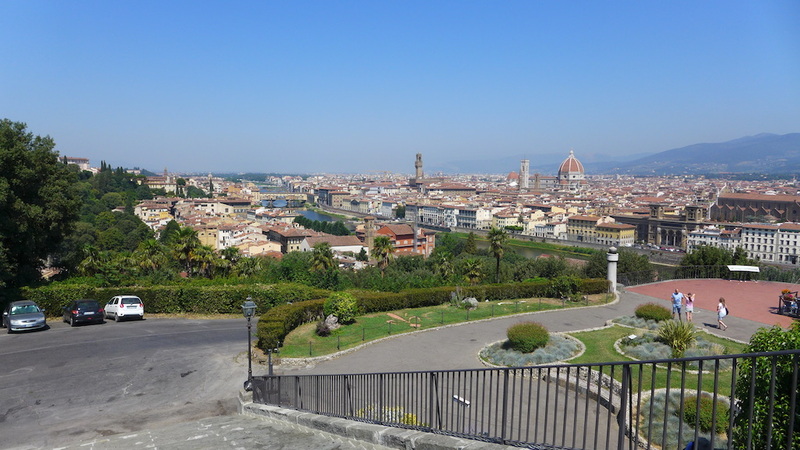 And so as to be forgiven for my long and unannounced silence I have written for you a short post about Florence whose beauty and charm can compete with Paris. 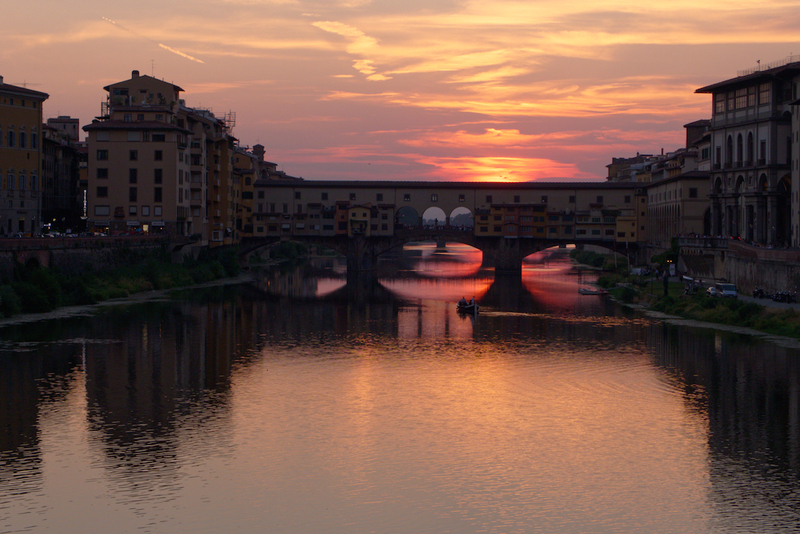 If you have never been there, I recommend you to go off on a jaunt and discover what is in my opinion the most beautiful of all Italian cities. 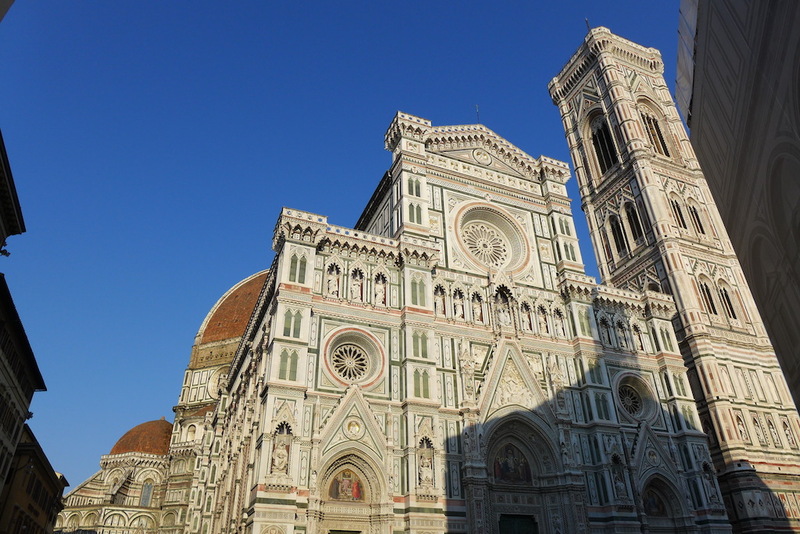 And I am pleased to let you know my tips and favourite places in Florence so as to help you make the most of your visit in this magical city! 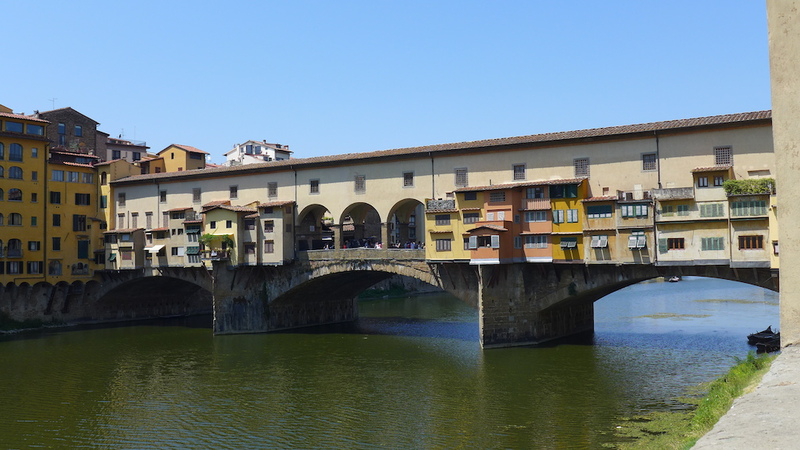 … among the crowds of visitors to admire the three major spots of Florence: the Piazza del Duomo, the Piazza della Signoria and the Ponte Vecchio. 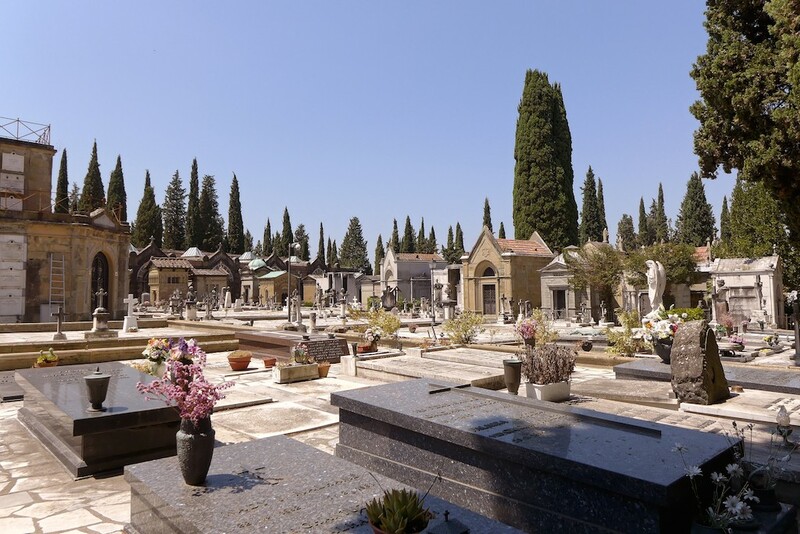 All three are located in the very heart of the city and are of course must-see for their beauty… but not necessarily must-visit as they are all highly crowded with groups of tourists. 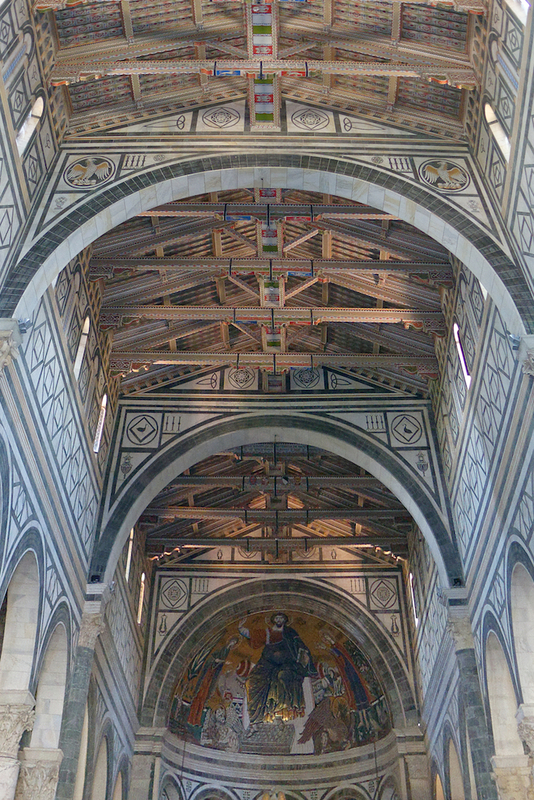 However if you wish to visit the Cathedral, the Dome or the Uffizi Gallery be prepared to queue for a while before entering. 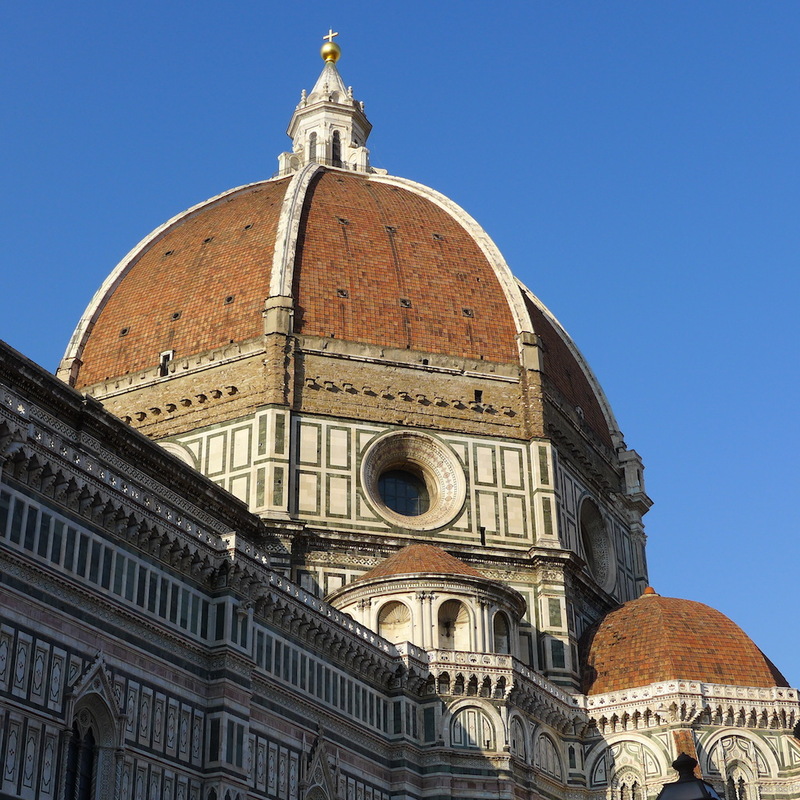 You can also book advanced tickets for the Dome or for the Uffizi Gallery. … at the opening or at lunch time (between 12.30 and 14.30). 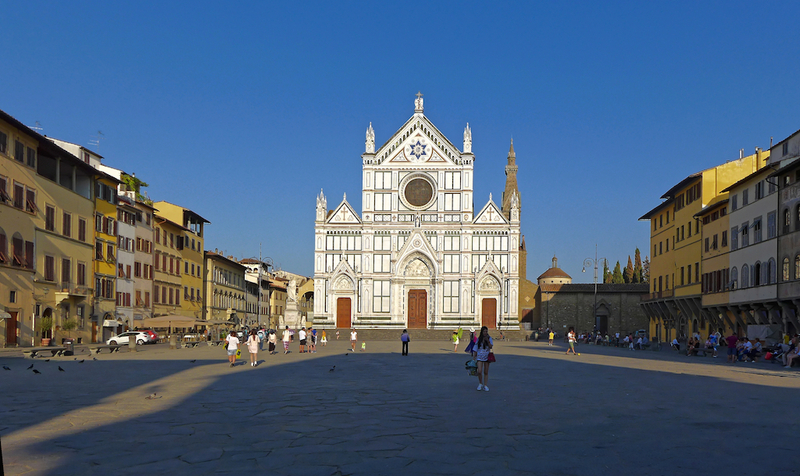 I loved the Piazza Santa Croce, a wide and very harmonious esplanade located in front of the Church. 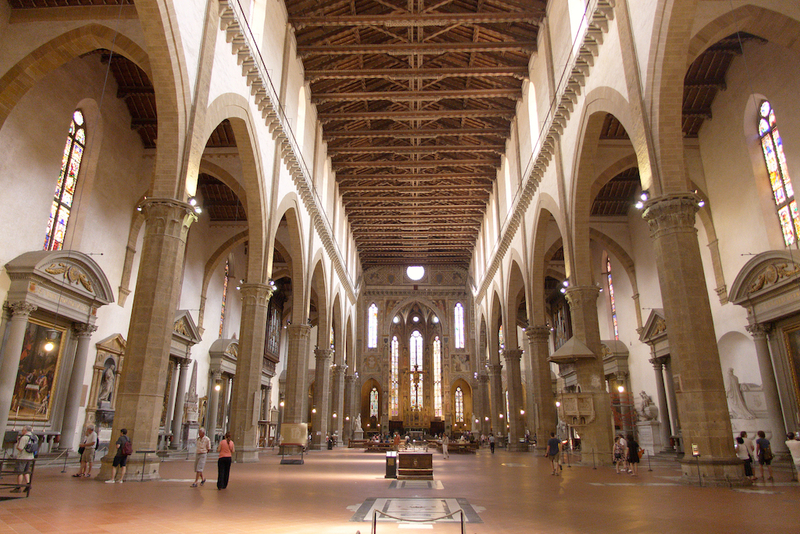 And the Church itself is a true museum with a magnificent architecture. 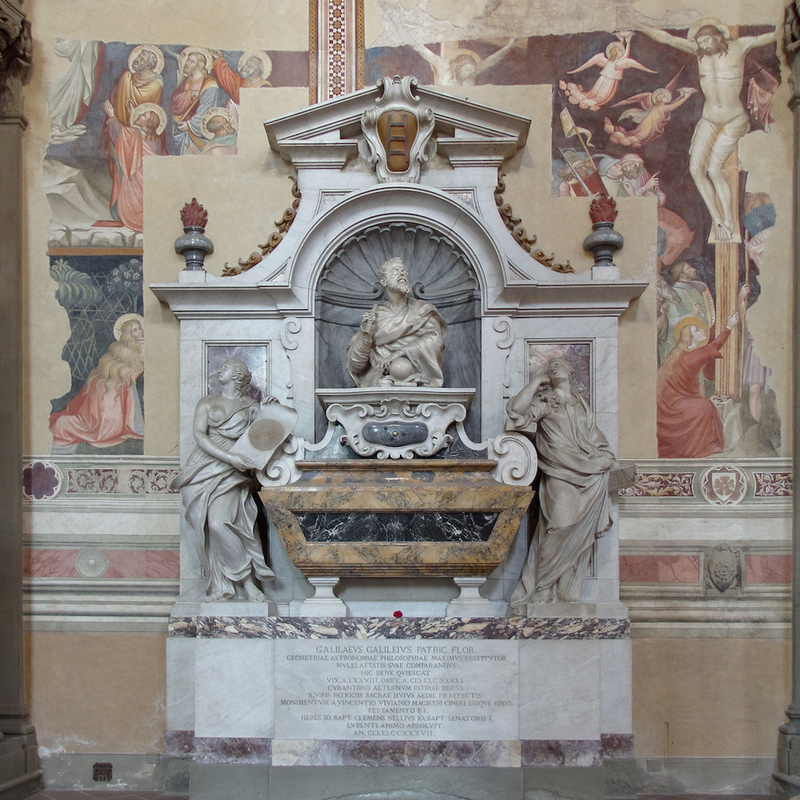 One can admire the tombs and memorials (including Galileo, Michelangelo,…), the remarkable paintings and frescoes, the very harmonious Pazzi Chapel built by Brunelleschi, the two cloisters, … The visit can take one hour and even if you have to queue for ten minutes before entering at the times mentioned, the Church is so wide that it is not crowdy at all. Do not miss it! 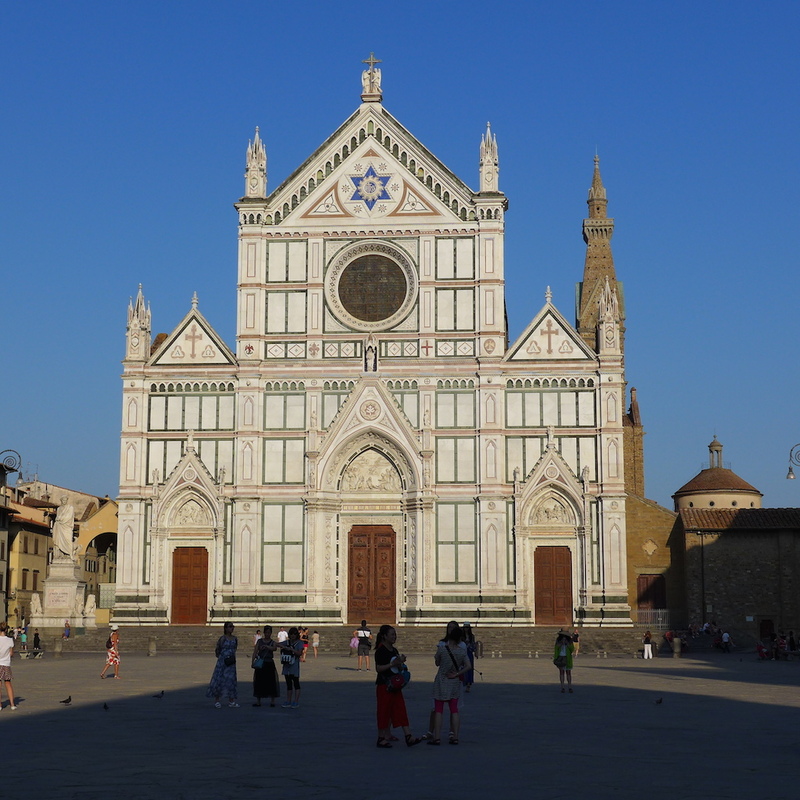 There are so many churches, museums and palaces to visit in Florence that it might be impossible to make a choice. 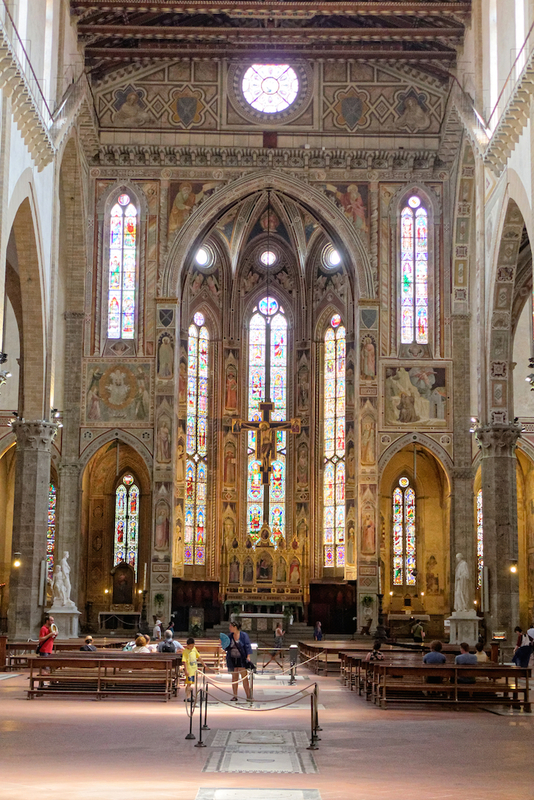 I have visited many of them and here are, apart of Santa Croce, and without any hesitation, my three favourite places: The Museum San Marco; The Basilica San Miniato al Monte; and the Bargello. 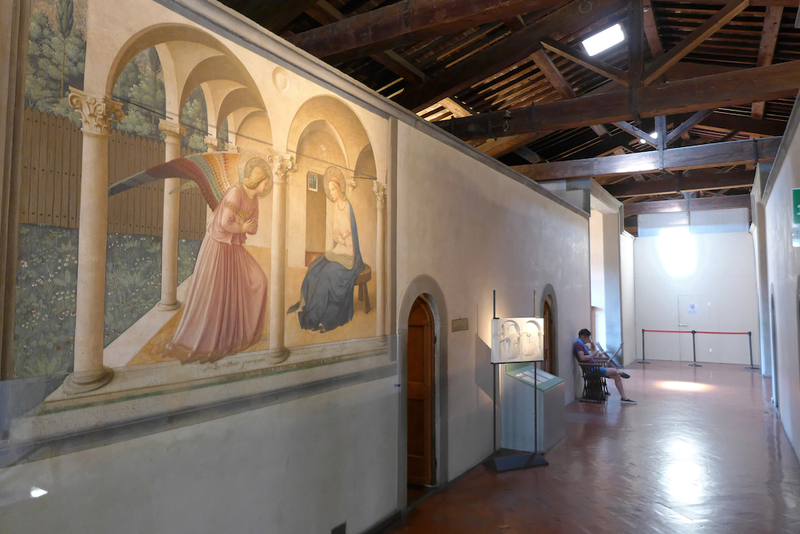 The Museum San Marco. 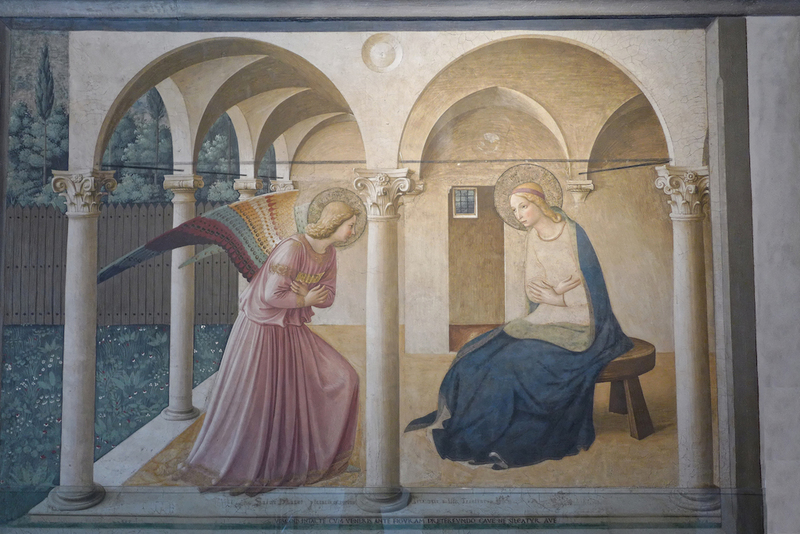 It is located in the Dominican convent of San Marco and is famous for its paintings by Fra Angelico. It is a marvel! 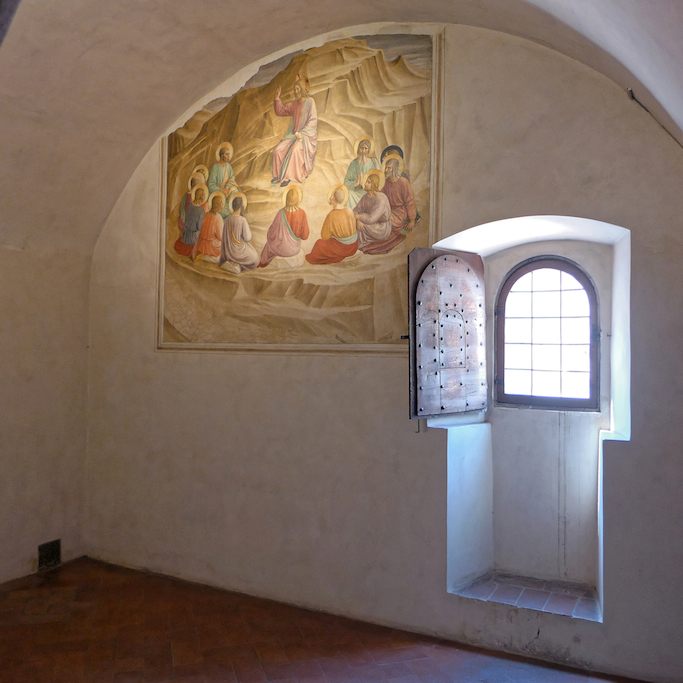 The place has kept its original atmosphere and one could stay for hours admiring the Annunciation or the frescoes painted by the artist in each monk’s cell. Moreover it is rather off the beaten track and one can really enjoy a peaceful visit. 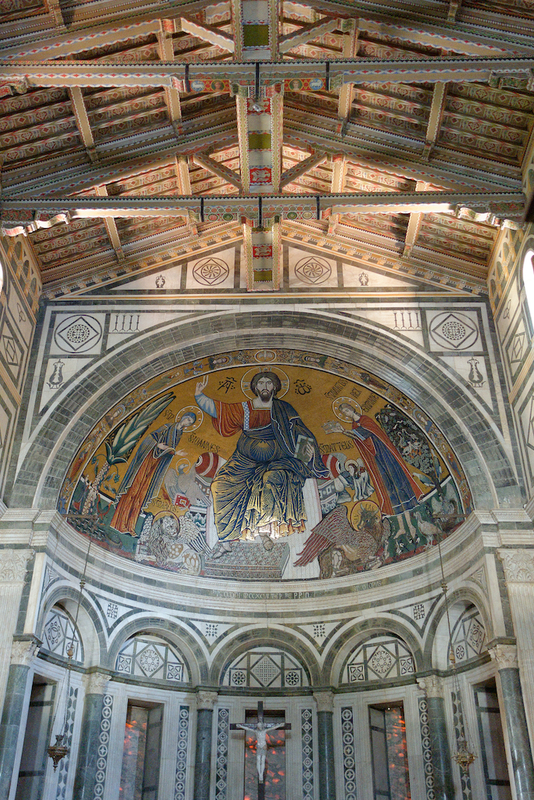 The Basilica San Miniato al Monte. 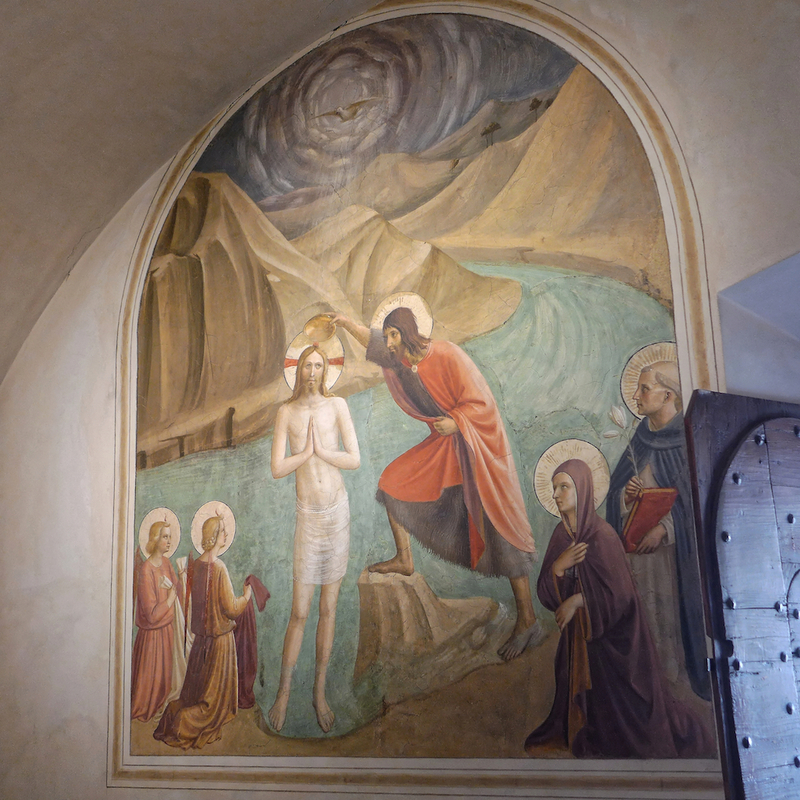 This small Church perched on a hill in the area of Oltrarno above the Piazzale Michelangelo is probably the most beautiful and scenic church that I have ever seen. 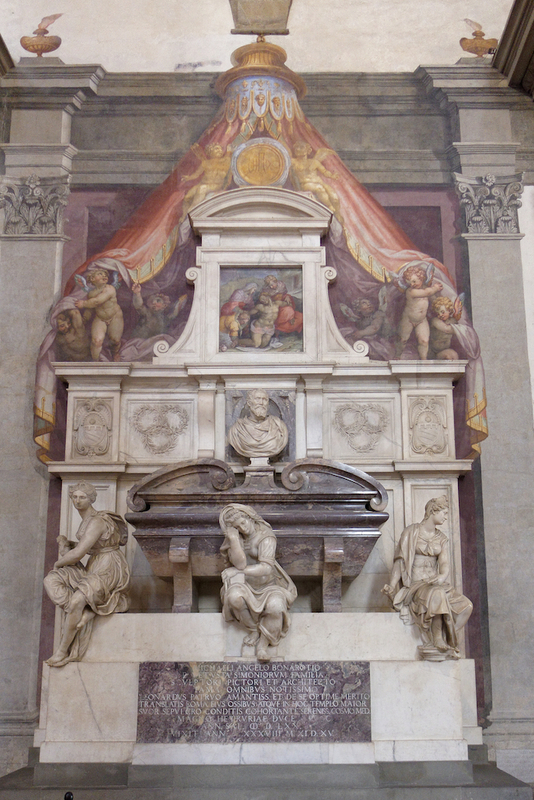 It reminds me of a jewelry box: everything inside the Church is wonderful and the small size of the building creates an intimate and warm atmosphere for the visit. I loved it! 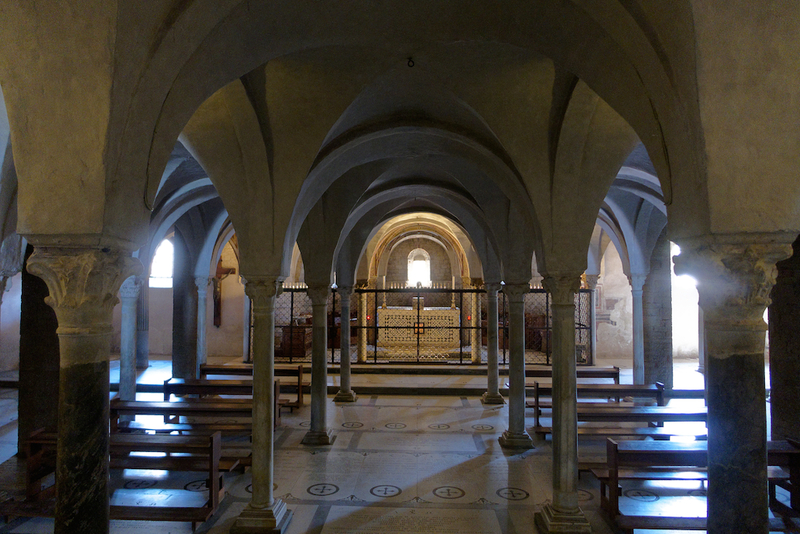 The adjoining monastery is still active and there is a little shop next to the Church where one can buy some of the monks’ works. And behind the Church lies a charming cemetery that I also recommend to see. 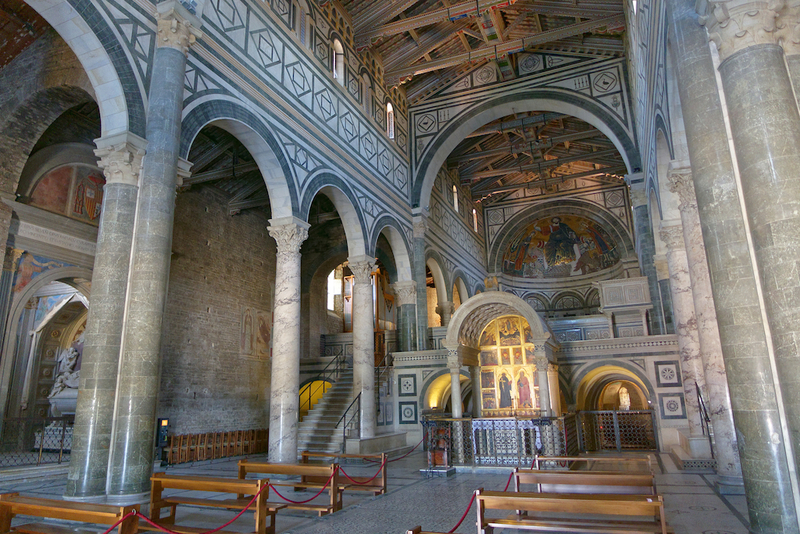 The whole (Basilica and cemetery) is not crowded at all as there are many stairs to climb before arriving. But so worth the visit! Do not hesitate. 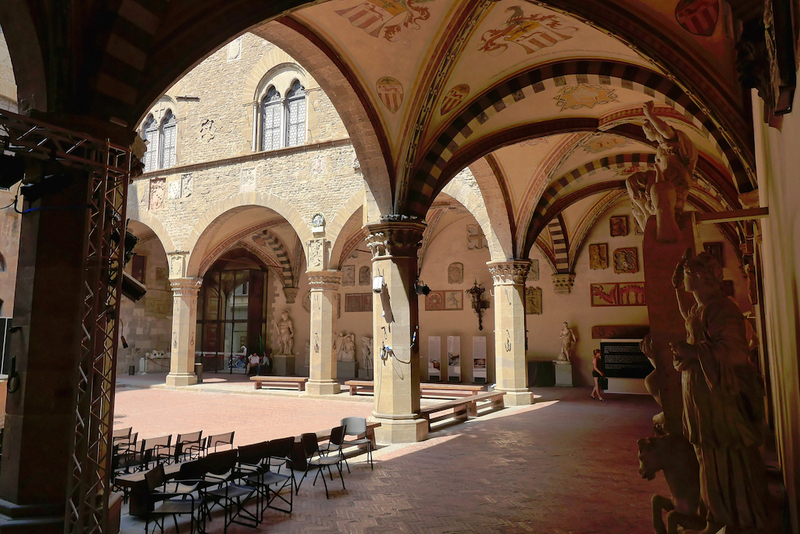 The Museo del Bargello. 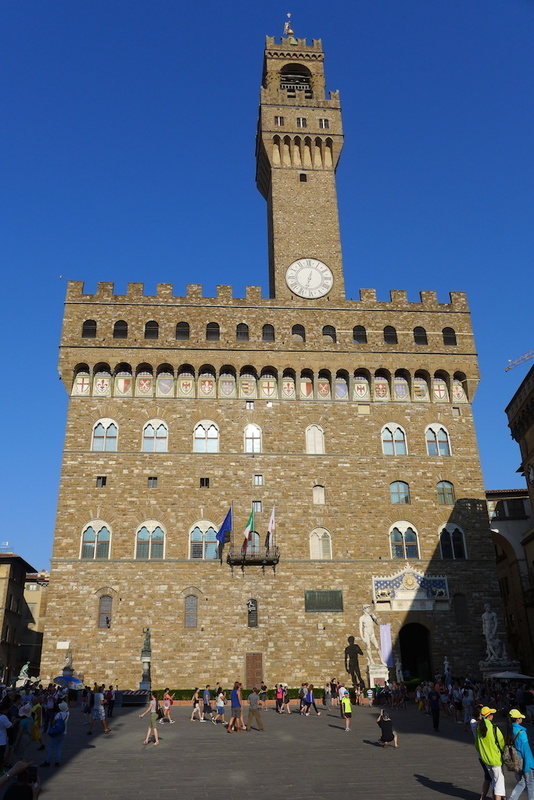 The Bargello looks like the Palazzo Vecchio in a miniature version. 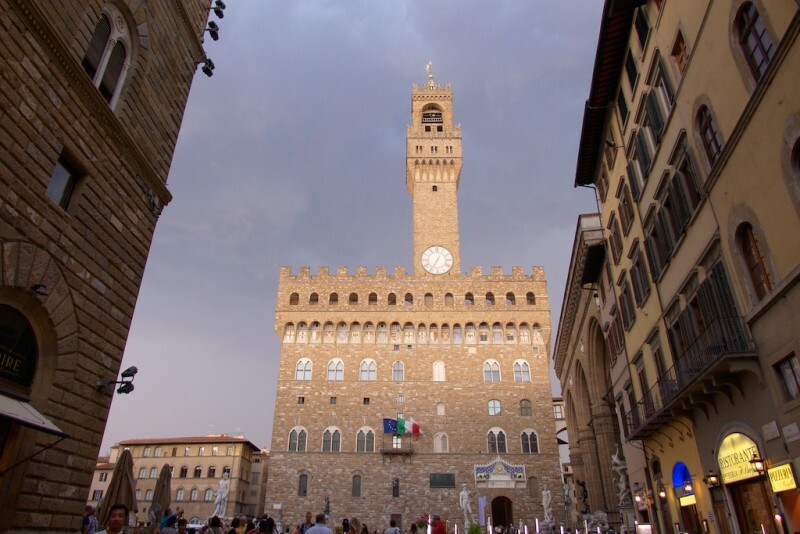 It is a beautiful severe building from the beginning of 13th century which used to be successively the Palazzo del Podestà, a court and then a jail. 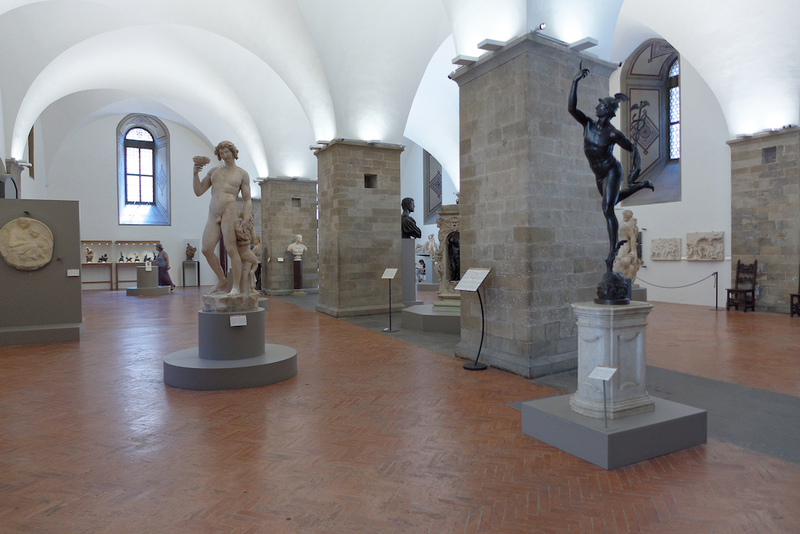 It shelters the National museum of sculpture and one can see there several masterpieces of the Italian Sculpture, all beautifully exhibited in the wide rooms and in the elegant inner yard of the Palace. 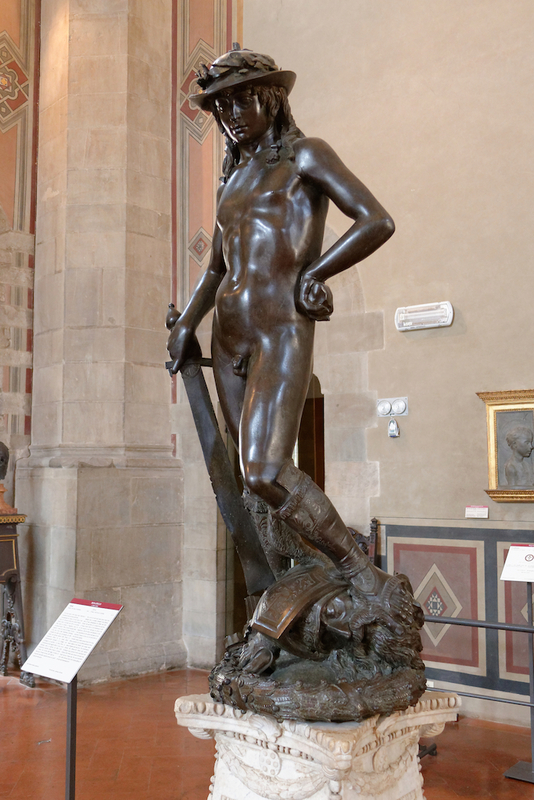 Among them: Bacchus by Michelangelo, Mercure by Giambologna,… and above all the magnificent David by Donatello. 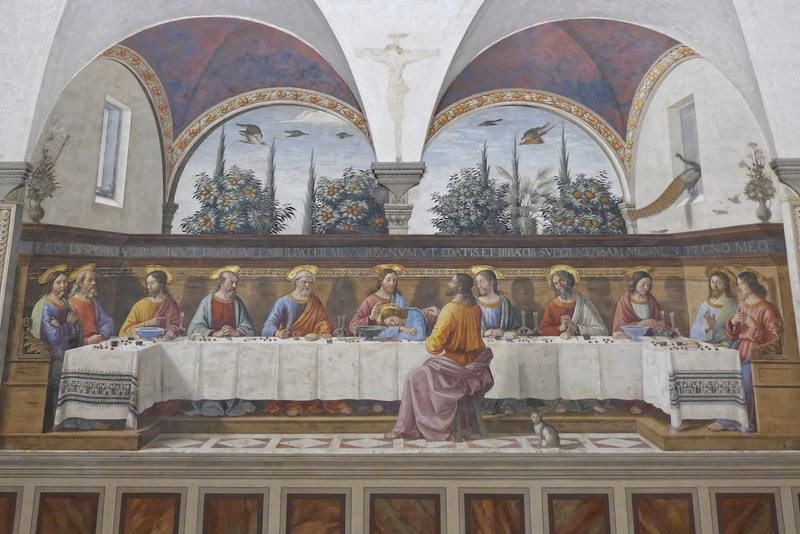 I enjoyed visiting the Bargello all the more since only few visitors (and no groups of tourists at all) come and see this beautiful museum. It is not crowded at all and one can admire easily all the works and take advantage of the serene atmosphere of the place. … a lunch or a dinner. 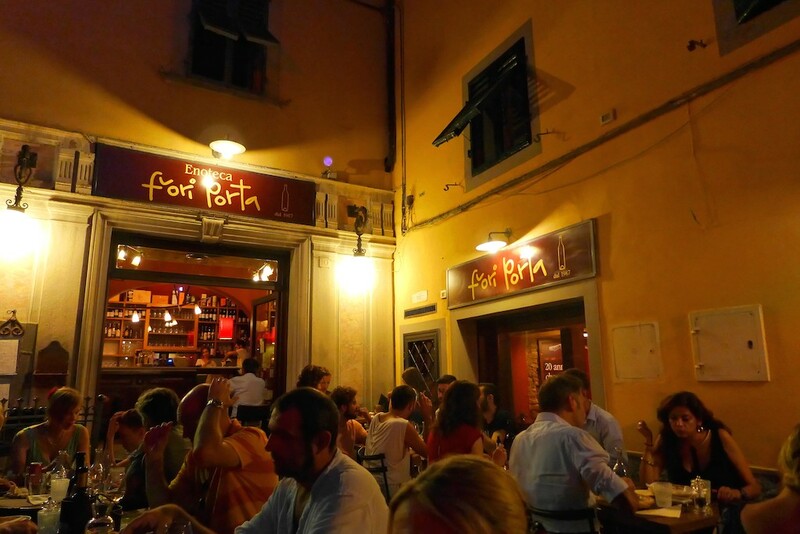 Trattorias, pizzerias, enotecas, in any street in the center of Florence one can find a place where to stop and enjoy a meal. 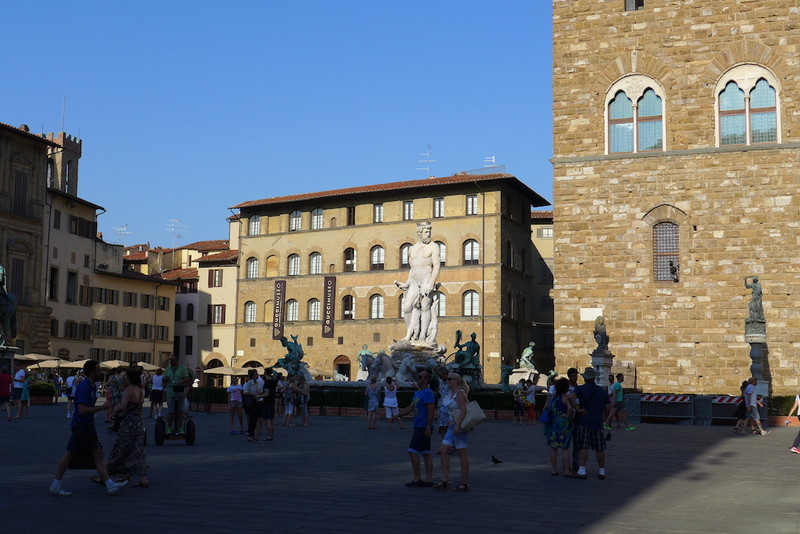 Not to mention the numerous shops selling paninis or the so numerous ice-cream makers. For sure one will not starve in Florence! 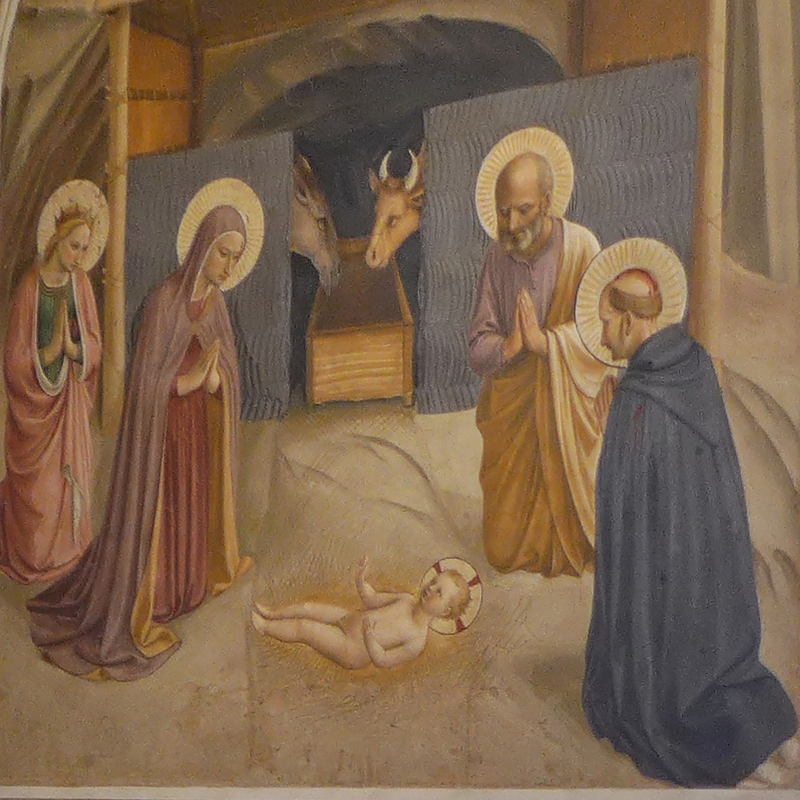 I have tried many places and my favourite has been an authentic Enoteca located Oltrarno in the pleasant district of San Niccolo: most charming terrace, warmest welcome, large choice of wines (by the glass or bottles), short but varied menu offering good fresh products, reasonable prices. 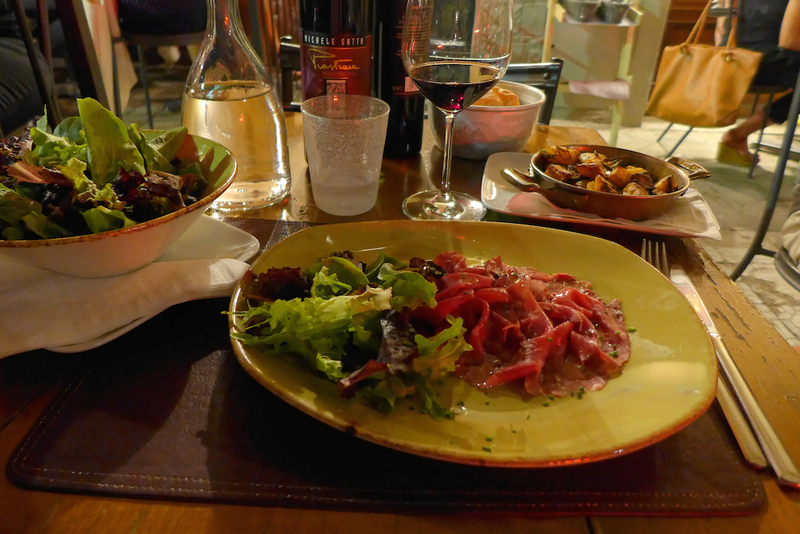 I had a delicious beef carpaccio with a mix of roasted potatoes and arugula salad and a very good Bolgheri wine. 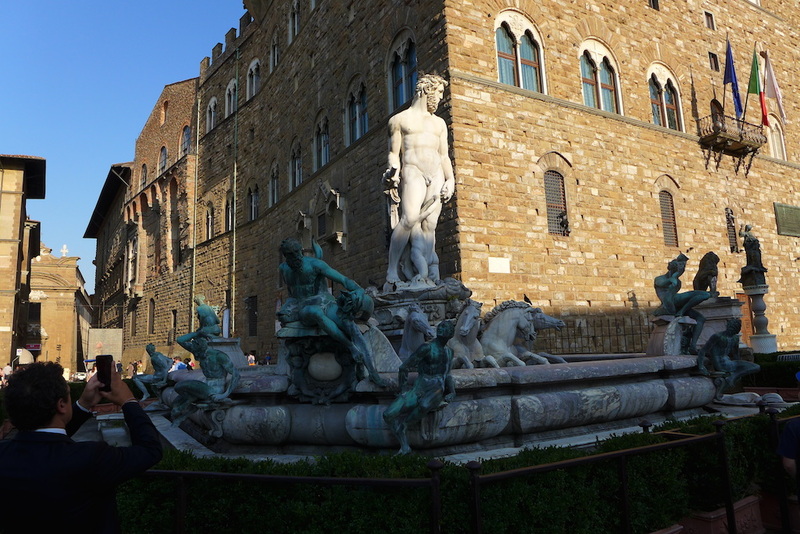 I would certainly return there when back to Florence for the terrace and the atmosphere! For quality Italian food and specialties: Eataly. 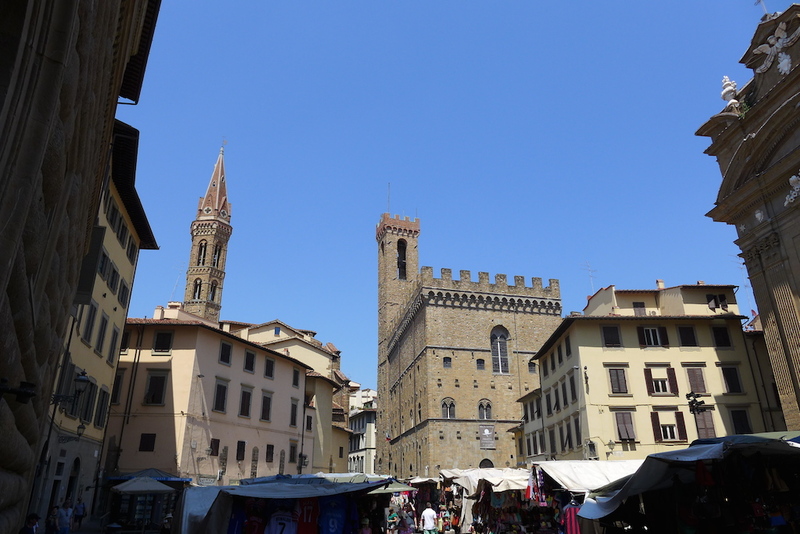 This beautiful airy shop located near the Piazza del Duomo offers the best selection of Italian food. Pastas, sauces, olive oils, antipasti, wines, … I love this store where I feel like buying everything. I let you discover their manifesto, so true! They have already opened shops in other cities in the world (especially in the USA and in Japan) and should inaugurate their first French store in Paris in 2017. For good Italian wine: Fratelli Zanobini. This is the best Enoteca where to buy wine to bring back home. The selection of Tuscanian wines such as Chianti, Brunello di Montalcino, Nobile di Montepulciano (my favourite!) favours the best producers: very nice bottles at interesting prices compared to any other Enoteca in town. And I was about to give up when I discovered Ottino, a small exclusive Florence leather shop which has been existing since 1830 and offers elegant quality handbags and other accessories all made in Florence, either in calfskin or deeerskin, at a very fair value. 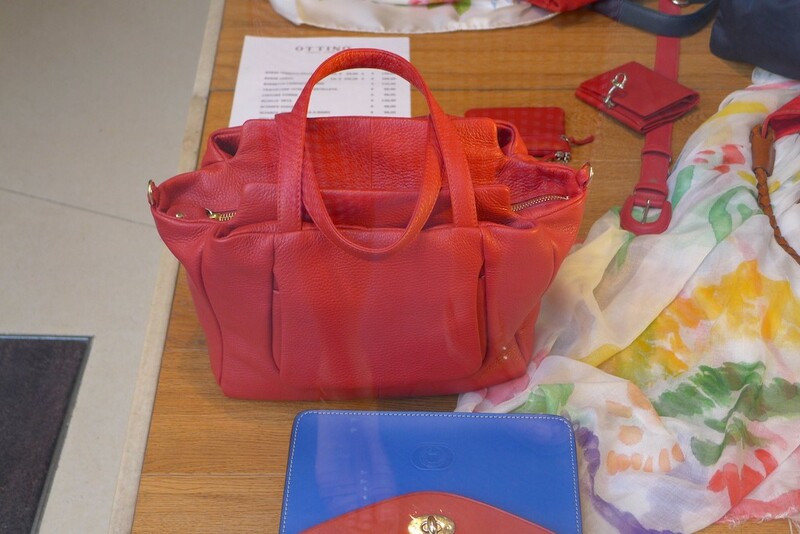 I have choosen a beautiful red handbag in calfskin and I like the idea that nobody else will have the same in Paris! 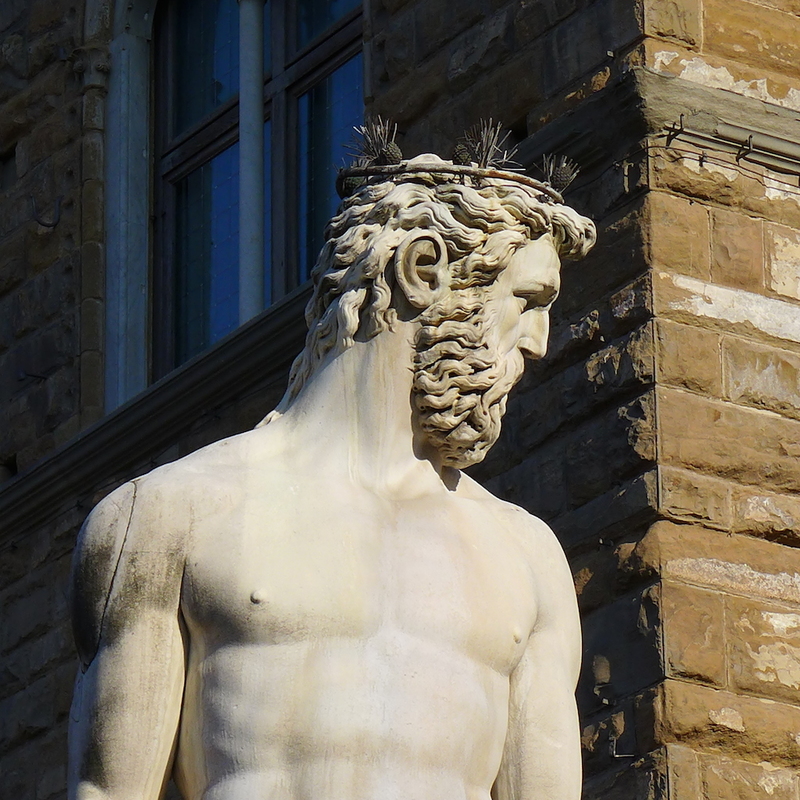 I have been very happy to share my tips with you and I hope that it will help you forgive my long silence and that I’ve made you want to visit Florence off the beaten track. And I will be back for new posts on Paris early September as I am leaving Paris in the coming days for true scheduled holidays! I wish all of you a very pleasant month of August.